نظام KNX هو من الأنظمة الرائدة عالمياً في مجال التحكم الذكي في الأبنية والمنازل. تهدف المنظمة العالمية (KNX (www.knx.org الى توفير نظام الناقل الواحد (Bus) الذي يتيح امكانية التوافق الكامل للأجهزة المستخدمة مما يوفر درجة عالية من التواصل الداخلي وذلك باستخدام برنامج حاسوبي موحّد (ETS). KNX هو نظام واحد (بدلا من حلول التحكم منفصلة)، حيث يتم توصيل جميع الوظائف لبعضها البعض وتقوم جميع الأجهزة بالتواصل مع بعضها البعض عن طريق كابل واحد. The “KNX” bus system is the world’s leading smart home and intelligent building control system. The KNX organization (www.knx.org) aims to provide a Bus System with fully compatible devices providing a high degree of interworking and One software for programming (ETS). ■The first global standardized system for intelligent electrical networking EN 50090 and ISO/IEC 14543. ■Over 120 internationally certified manufacturers. ■Forming a platform on which the products of all certified manufacturers are compatible with one another. ■One common software tool is needed for the planning and commissioning of all KNX installations (ETS). 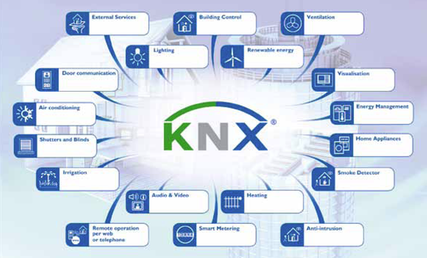 ■The constant enhancement of the system is coordinated in the head office of the KNX Association in Brussels. ■Comprehensive training courses are available. 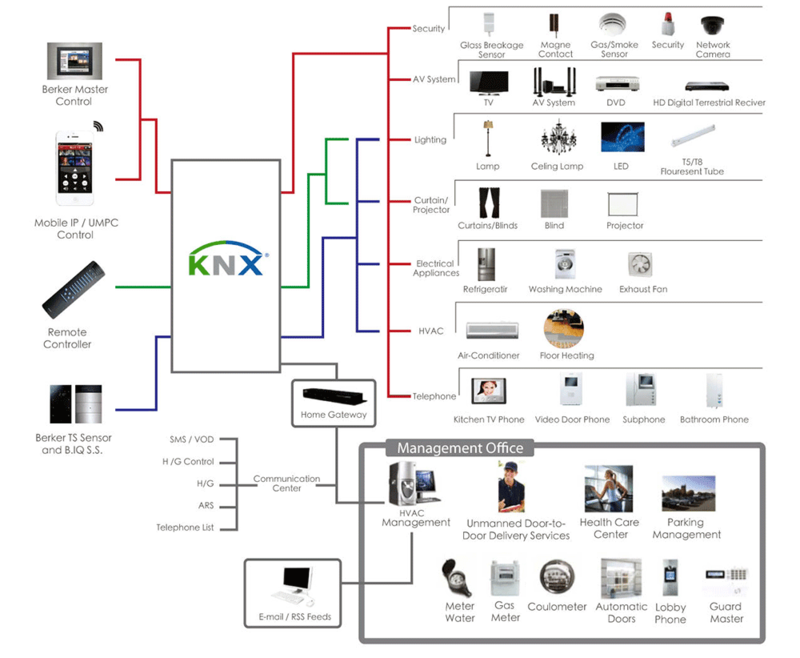 ■KNX stands for a widespread system with growing acceptance around the world.